Parachute, Single point, quick release with seat pack. Type C-2. Stores reference 15A/197. Commonly referred to as the 'pilot's parachute'. Classic white webbing with a central pale red/black fleck. Correct fully rounded quick release (QR) box, waistbelt, ripcord housing, ripcord and handle. With pack and backpad. The webbing harness is in very good clean condition. There is no label and no obvious signs of label removal. 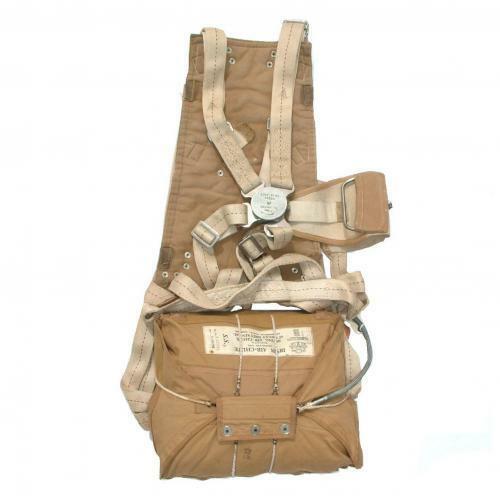 The Irvin Air Chute parachute pack itself is in the usual sand coloured canvas with large label marked 'Irvin Air Chute - Aeroplane Type, Manufactured by Irving Air Chute of Great Britain Ltd.' Also marked 'S.S.' and 1940 dated (assumed original but no way of confirming). Also has ink Air Ministry crown mark and serial number. With bungee cords. The pack is currently padded for display with an 18' diameter canpy dated 1940. This has some holes/damage and lacks rigging lines. The pack is in very good condition and has a good Sorbo rubber filled seat cushion attached - this is reasonably clean, War department broad arrow and reference number marked. Whilst the rubber insert is flexible there is some shedding of rubber dust through the brass eyelets on the pack. The harness has a matching (though of commonwealth manufacture) MK.1 Irvin backpad in good used condition. An impressive display piece. More photos are available on request. Stock code S18507.